Having recently tried my hand at homemade puff pastry, I needed to find ways to use it. 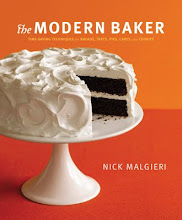 One of the recipes I was most excited to try was Perfect Elephant Ears on page 210 of The Modern Baker by Nick Malgieri. Although we won’t get to the Puff Pastry section in the Modern Baker Challenge for almost a year, I couldn’t wait to make these wonderful looking pastries. The ingredients list couldn’t be any simpler: puff pastry and sugar. That’s right, no cocoa, cinnamon, or other spices. 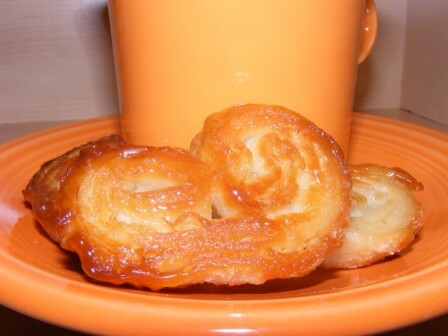 Just puff pastry rolled in enough sugar to caramelize the ears. 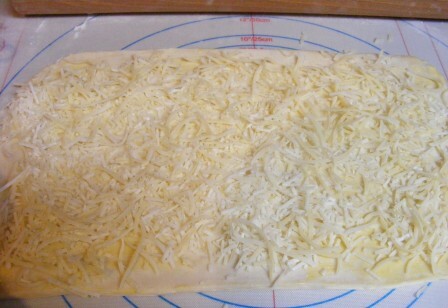 I began by sprinkling the board and puff pastry liberally with sugar, then patting out the pastry to soften it slightly. 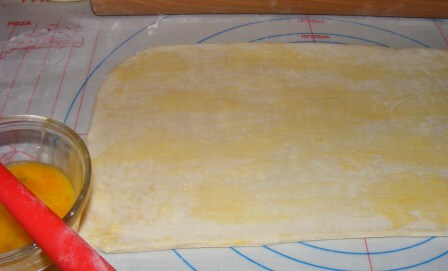 I rolled the pastry into a rectangle, adding more sugar to the board and top of the pastry as I went. I rolled the sides of the pastry in toward the middle, then rolled one side over the other and flattened the resulting cylinder slightly. 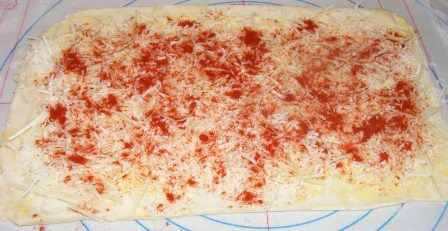 After chilling the dough, I sliced it with a sharp knife, dredged the pieces in sugar, and put them on a baking pan lined with a Silpat. I baked the elephant ears at 375° F for about 18 minutes, until they were well caramelized, almost to the point of burning. 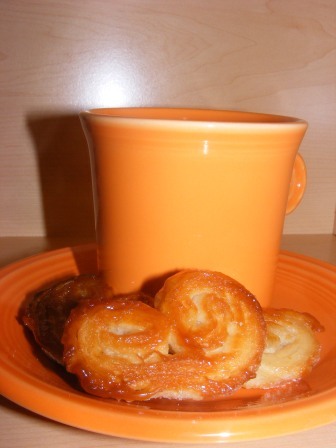 I enjoyed the elephant ears with a cup of tea. 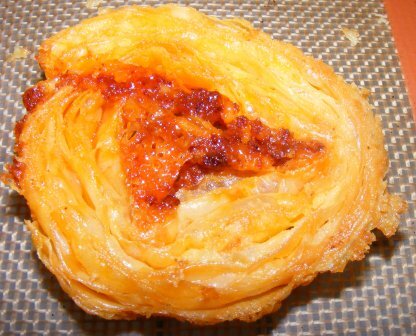 The lightness of the puff pastry paired well with the caramelized sugar. These pastries were so simple to make, but were delicious enough to serve to company. Now that I’ve discovered how easy it is to make puff pastry, I will have treats like these elephant ears around quite often. Although we won’t get to the Puff Pastry section in the Modern Bake Challenge for about another year, I have been wanting to try the Perfect Elephant Ears on page 210 of The Modern Baker for a while. 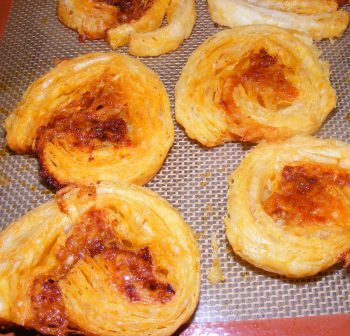 And I couldn’t see making them with store-bought puff pastry. So I’ve been eyeing the basic Instant Puff Pastry recipe on page 195 for some time. But what finally tipped the scale was actually a recipe from Dorie Greenspan‘s new book, Around My French Table. I wanted to try a few recipes before French Fridays with Dorie started in October. And one that caught my eye right away was the recipe for Mustard Batons on page 15. They start with puff pastry, and again, I couldn’t fathom buying puff pastry in the frozen food section when I had Nick’s recipe to try. The Instant Puff Pastry recipe is simplicity itself. It only has four ingredients — flour, butter, salt, and water. 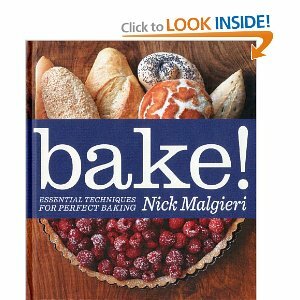 And unlike the typical puff pastry recipe, which requires multiple “turns” to fold and roll chilled butter into the dough, Nick’s recipe incorporates the butter into the dough from the beginning. 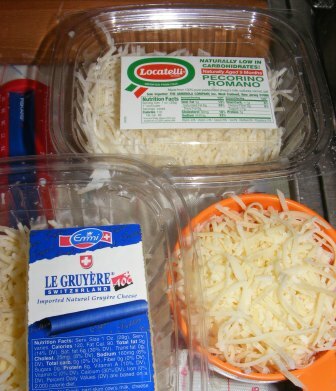 After combining the flour and salt in the bowl of the food processor, I added the butter (chilled and cut into pieces). I pulsed mixture, then added the water and finished mixing the dough. 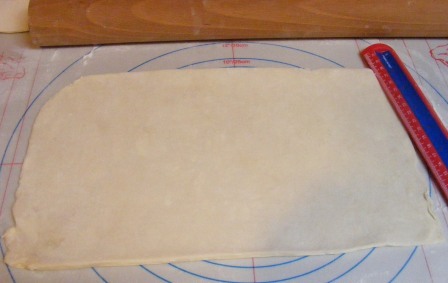 Then I turned the dough out onto a floured board, where I pressed and rolled it into a rectangle. I cut the rectangle into two pieces, folded each piece in thirds, then rolled and flattened the resulting cylinders. 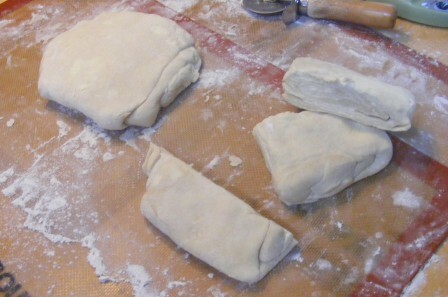 I cut each piece of dough into three pieces. 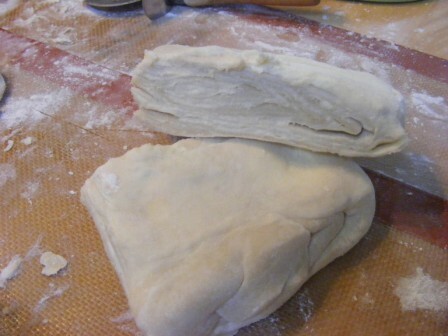 As you can see from the pictures, the dough exhibits the layering of puff pastry, so I was hopeful that it would bake up with the same lightness. I wrapped each piece of dough, froze four of them, and refrigerated the other two to use for Mustard Batons and Perfect Elephant Ears. I baked the batons and elephant ears over the next few days. And how did the puff pastry perform? You’ll have to check out the Mustard Baton and Perfect Elephant Ears blog posts to find out. But I’ll give you a hint: I will never buy frozen puff pastry, nor will I ever be without homemade puff pastry in the freezer.